Dung beetles are the focus of a collaborative national research effort to turn 80 million tonnes of dung produced by Australian livestock each year into a multi-million dollar benefit to farmers. * CSU will lead a national research effort to develop producer knowledge and capacity to enable dung beetles to deliver on-farm benefits. * The project will quantify the environmental and economic value of dung beetles on farms, investigate native and imported dung beetles and deliver a regionally specific dung beetle service to farmers. * Meat & Livestock Australia (MLA) is supporting the project through funding from the Australian Government’s Rural Research & Development for Profit program. Dung beetles are the focus of a national research effort to turn 80 million tonnes of dung produced by Australian livestock each year into a multi-million dollar benefit to farmers. The $23 million project will be led by Meat & Livestock Australia (MLA) with the research being led by Charles Sturt University (CSU) through the Graham Centre for Agricultural Innovation. 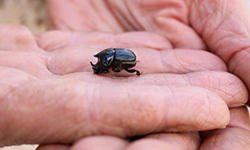 A CSIRO run program from 1964 to the mid 1990’s introduced dung beetles from southern Africa and southern Europe, with 23 species established in Australia. 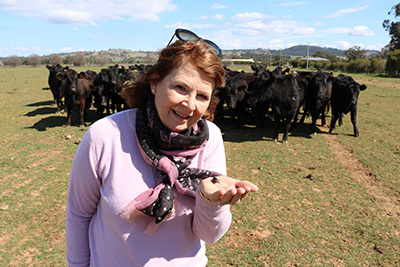 CSU Professor Leslie Weston said this new project will develop information and pathways for dung beetles to be incorporated more widely into livestock production systems. “A key part of this research is developing a regionally specific dung beetle service to farmers supported with extension and monitoring activites,” Professor Weston said. The five-year project is supported by MLA through funding from the Australian Government’s Rural Research & Development for Profit program. MLA’s Sustainability Innovation Manager Mr Doug McNicholl said the project would enable producers to gain greater knowledge of and access to dung beetles that can provide significant productivity and environmental benefits on-farm. “Dung beetles play a critical role in grazing ecosystems. By burying dung in the soil, the beetles improve the flow of water, nutrients and carbon into the root zones of pastures, which improves pasture productivity. And by disturbing the dung, they prevent build-up of flies and worms which in turn improves animal productivity. The research is led by CSU with eight partner organisations: The University of Western Australia, CSIRO, Manaaki Whenua – Landcare Research, The University of New England, Dung Beetle Solutions International, Warren Catchments Council, Mingenew-Irwin Group and the Western Australian Department of Primary Industries and Regional Development. The Graham Centre is a research alliance between Charles Sturt University (CSU) and the NSW Department of Primary Industries (DPI).